The Lightning Ridge Holiday Park is one of the original caravan parks in Lightning Ridge located right in the centre of town. It’s just off the main roads so it’s very quiet, and within walking distance to a range of shops, galleries, cafes and the Lightning Ridge Bowling Club. The park is located next to the Aquatic Theme Park and Indoor Olympic Diving heated pool. 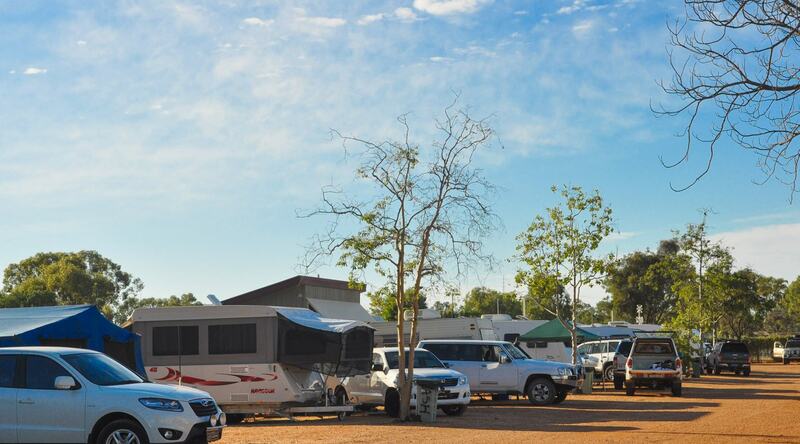 The Lightning Ridge Holiday Park consists of 4 Self Contained Budget Ensuite Cabins, 4 Powered Ensuite Sites, 60 Powered Sites, 6 Un Powered Sites & 10 Tent sites. During the cooler months the outdoor fire pit provides a cosy area for park visitors to meet each other and share their experiences. During the peak season April – September you can even enjoy happy hour at the camp kitchen which happens a few nights a week provided by the owners. The Lightning Ridge Holiday Park has a great Camp Kitchen which includes Free gas BBQ’s, Pizza ovens, fridge, Microwave and more. Other facilities available on site include car washing facilities, dump point, book exchange, laundry, a tour booking office and pick up point for all tours. We are CMCA Friendly and a member of the NSW Caravan and Camping Association. Amazingly friendly staff and the cabins were in good condition and were very comfortable during our stay. Pet Friendly too! A great place to crash after a day of fosssicking! I’ll definitely be staying here again next time! Referred by Pat from Tourist info was perfect location right in town. What a pleasant surprise to have a nice grass site for our tents, in the outback where there is no rain. Our hosts made us very welcome helped book tours were always around if we needed advice. We loved our stay in Lightning Ridge.